Find out all you need to know about the different types of flooring and which is best for your space through our Help Center. We answer all your questions about engineered hardwood floors, utility grade, solid wood floors and more. If you are still unsure what to buy or have more questions, feel free to contact us. Solid wood flooring is crafted from a single piece of hardwood lumber. Whether it is made of Red Oak, White, Hickory, or Maple our solid hardwood floors are all ¾” thick with random lengths.  In addition, all of our solid wood floors are made within 200 miles of our Murphy, North Carolina warehouse, saving thousands of dollars on freight. Our Cabin grade is possibly the cleanest Cabin on the market. Less color variation, less knots, and a longer average board length than our Rustic grade, this pre-finished solid hardwood floor has been a mainstay for our business for years, and is a popular choice with our repeat buyers. Expect board lengths between 60″-10″, with an average of less than 18″. Most boards will be less than 20″ Please keep in mind that our Cabin grade was removed from the #1 or first quality products one board at a time at the manufacturing facility. This grade accepts some visual defects such as: planer marks, wormholes, mineral streaks, etc. Our Engineered Blue Label flooring is an exceptional value. Made by a company that prefers us not to use their name, our Blue Label floors are made with the same sawn face local hardwoods as their higher end, first quality products. These 8 ply, 1/2″ thick hardwoods have a 1/8″ veneer top, one of the thickest in the industry – and it is made in the United States! The lowest grade of all pre-finished flooring, this grade accepts anything; short pieces, sander burns, splits, large knots, pieces missing a tongue on one or both ends, etc. Any and all of these can be in a box of utility grade wood. That being said, it is still pre-finished, solid wood at half the cost of unfinished wood flooring. Your flooring will contain a large amount of boards with cut ends. If you do not use these boards, your waste will be much higher.You will need to figure 20% waste, and you should get a serviceable floor. If you will be hiring an installer to install your Utility grade flooring, make sure that you mention to him/her that you are using this grade. Due to the limited availability of the Utility grade, most installers are unfamiliar with it, and they will either charge more to install it, or they will try to install the floor as a #2 common floor, resulting in waste exceeding our recommended 20%. Who knows? Although that answer may sound a bit forward, it is very true. Only the customer knows which defects will be thrown away and which will be used. Frequently our manufacturing partners will run test lots of material. These are usually new products they are considering offering to their customers. These lots are typically mill run, meaning they are ungraded, and will contain some Cabin grade mixed with some 1st Quality. Because we cannot get more of the material in each lot we cannot break the lots. Although the test run lots are sold without a warranty, they are still a great value on a one of a kind floor! This type of hardwood flooring is constructed to be much more stable than solid floors in areas that experience large humidity swings throughout the year. Here is the definition of engineered hardwood flooring from the National Wood Flooring Association: Engineered wood floors are real wood floors that are manufactured using three to nine layers of different wood veneers. The sub layers can be of the same species, or of different species. The grain of each layer runs in different directions, which makes it very stable. This means that the wood will expand and contract less than solid wood flooring during fluctuations in humidity and temperature. The top layer of engineered wood flooring consists of high-quality wood. While this type of flooring can be sanded and finished, it cannot be done as many times as solid wood flooring. Engineered wood flooring can be installed above, on or below grade. All engineered floors can be nailed, stapled, or glued, and most can be floated. While most engineered flooring is installed over concrete subfloors, a growing percentage of above grade installations are utilizing engineered flooring because of the higher demand for wider boards. All of our engineered hardwood floors are made in Tennessee, South Carolina, North Carolina, or Virginia. Our Engineered Cabin grade flooring is an exceptional value. This floor features the same aluminum oxide finish as the rest of our floors. Each lot will vary, but expect most lots to contain a high percentage of boards less than 18” in length. Expect a wide variation of color, as well as more naturally occurring character features such as knots, worm holes, etc. Buying 10% waste is recommended with our Engineered Cabin floors. Some finish defects such as planer marks can be included. The Rustic grade is a new grade for us. This floor is made by one of the top 5 hardwood manufacturers in the US, and they prefer that we do not put their name on the product. This floor is allowed to have knots larger than 3/8”, and more color variation than Cabin grade. Some lots may have a large amount of wormholes, but will have very few, if any, cut off ends. Consider our Rustic grade to be 90% usable. This grade will contain a large amount of short boards in some lots. Board length can vary from 8” to 48”, with the majority being under 18”. Because of the grading and the shorter board length, our Rustic grade will display a large amount of variation. This grade accepts visual defects such as planer marks, wormholes, mineral streaks, etc. Our Engineered Seconds all have a defect or a missed specification. Dye lot variation, color defect, gloss level, and milling are all examples of defects. If a lot made today has a gloss level different from the specification, it cannot be mixed with a lot made last week, so it would be downgraded to seconds. Our engineered floors are subdivided into 3 groups: Seconds with defect, Graded Seconds, and Builder grade. Seconds with defect will be listed with the primary defect in a lot. Feel free to inquire about the defect. Be sure to include the amount of footage you need. For a list of defect definitions click here. Our sample grade flooring comes from one of the top manufacturers in the U.S. This First Quality material is only 10 percent waste and the No. 1 common and better floor. Our sample grade flooring is a new product for us and is only available for a limited time. Click here for more detailed information about our sample grade flooring and browse pictures for an accurate representation of grading and board length. ReallyCheapFloors.com will buy back anything we sell for any reason(s). We allow your return to include 1 open box. Any other opened boxes will not be refunded. We will accept partial order returns on Running Line inventory but no partial returns will be accepted on Closeouts or Take All lots. Customer will be responsible for all freight cost. In the event you have a problem with your floor, contact us before you install it, not after. It would be quite difficult to return an installed floor. Because of the inherent color variation in wood, we cannot warranty that our products will be an exact match to the picture on our website.